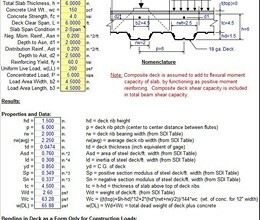 "DECKSLAB" is a spreadsheet program written in MS-Excel for the purpose of analysis and design of slabs on metal deck. 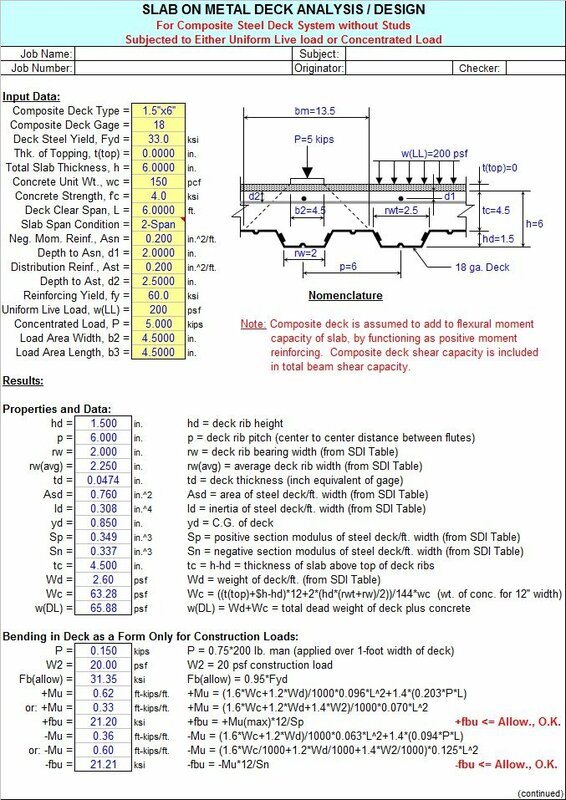 Both composite deck slabs and form deck slabs can be analyzed and designed for 3 different loading conditions. Specifically, the flexural moment capacity for both positive and negative strong axis moments, one-way beam shear, punching shear, and deflection are all evaluated and checked. Also, for concentrated loads, the effective slab strip widths for both moment and beam shear are determined. There is information on the metal deck properties, as well as reinforcing bar and welded wire fabric data tables. 2. In the "Composite Deck" worksheet, since the composite deck is interlocked or engaged with the concrete, the deck is assumed to function as the positive moment, bottom face slab reinforcing. The shear capacity of the composite deck alone is added to the beam shear capacity of the concrete to arrive at the total beam shear capacity of the slab. 3. In the two form deck worksheets, the form deck is assumed to be "inverted" and not to contribute to the flexural moment capacity of the slab. The user has the option to include or not include the form deck shear capacity in the total beam shear capacity of the slab. 4. In the "Composite Deck" worksheet, the user may select anyone of 5 available sizes (profiles), 1.5"x6", 1.5"x6"(Inv), 1.5"x12", 2"x12", and 3"x12". 5. In the two form deck worksheets, the user may select anyone of 3 available sizes (profiles), 1.5"x6", 2"x12", and 3"x12". 6. In the "Composite Deck" and the two form deck worksheets, the user may select either a 1-span, 2-span, or 3-span condition for analysis. 7. In the "Form Deck (1-layer Reinf.)" worksheet, the reinforcing parallel to the slab span length functions as both the positive moment (between slab supports) reinforcing and the negative moment (at slab supports) reinforcing. When welded-wire fabric (WWF) reinforcing is used, this program does not allow the user to consider "draping" the reinforcing to maximize the positive and negative moment capacities. 8. In the "Form Deck (2-layers Reinf.)" worksheet, the bottom layer of reinforcing parallel to the slab span length functions as the positive moment (between slab supports) reinforcing, while the top layer of reinforcing parallel to the slab span length functions as the negative moment (at slab supports) reinforcing for the 2-span and 3-span conditions. Both positive and negative moment capacities are based on assuming a "singly-reinforced" slab section. * DECKSLAB download link provides freeware version of the software. Can you tell me the meaning for S. R. in the spreadsheet? DECKSLAB has been rated 3.8 out of 5 points. A total of 6 votes cast and 2 users reviewed the software.